My fellow fantasy author Andy Peloquin just released the second book of his Queen of Thieves Series. Both books are at 99 cents for a limited time, so you might like to check them out. The first time I saw the cover of this book, I was like “What the hell!” A cat on a burrito, flying through space! I just had to grab it. I was glad I did so. Time Burrito is an excellent science fiction-comedy. It doesn’t fear to laugh at certain tropes of the genre, and this makes it an even better read. There are also satirical elements in the story, which add to the fun. The main character “Pete” is a pretty useless guy, and it was interesting to see all the mistakes he makes along the way. David Gemmell was one of the inspirations behind my short story A Song of Blood. So, I guess, I just had to write this. It’s been over two years since I first read Sword in the Storm. I can vividly remember being blown away by the rich storytelling, infused with themes of courage, redemption and the grey nature of the Rigante world. It was a fantasy novel and of course there was magic. Magic unlike any I had experienced earlier. It was a magic not of spells and curses and incantations, but of the soul. Good acts of people added to it, while bad deeds depleted the magic. However, the best aspect of Gemmell’s writing was his optimism. One could stare Death in the eye, guaranteed to be slain in a battle tomorrow, but still be hopeful, chat with friends and make merry and enjoy life to its fullest today. Gemmell’s novel was not merely a very entertaining read to me but a life lesson. I recently read the third novel in the Rigante series, Ravenheart . I found it having the same master storytelling of the first two books, if anything, it was actually even better. There was a scene in which a one-eyed man beats down a fighter, trained to be the best in the land. In the hands of a less gifted writer the scene would have likely become mediocre and clichéd, where the weak beats the strong. But here, Gemmell pulls it off magnificently. My heart soared as I read the particular scene, Gemmell saying that the one-eyed man seemed to lift the mountains in the background on his shoulders. Towards the end there were a series of scenes, in which the seed of unity is sowed between two peoples at the face of utter injustice. I was holding back tears, mesmerized by the intensity of Gemmell’s writing. It’s sad, David Gemmell is no more. As per Wikipedia, he died writing. I consider that kind of death an honour for any writer (who wouldn’t!) The best artist often dies doing what they love, getting lost in their creation forever. Gemmell continues to live through his wonderful books, inspiring readers like me to live life at its fullest, no matter what and be optimistic in the worst of situations. Like that flower growing in the snow, not a single other plant in sight, most beautiful because it has hope. I stumbled upon Instafreebie less than a month ago. I had 150 mailing list subscribers back then. Now I have nearly 900, and the numbers are only steadily climbing. The subcribers all came from cross promos a certain facebook group organises, of which I am a part of. The magical thing about Instafreebie is that every time anybody downloads a book, they are automatically included into the authors newsletter. I recommend Instafreebie to any author, big or small, who wants to reach out to an even wider audience. 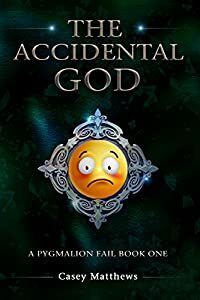 Check out The Accidental God (A Pygmalion Fail Book 1) on amazon! Check out The Invisible Entente: a prequel novella on Amazon! The Invisible Entente is one of those books which keep you on the edge of your seats. This is urban fantasy at its best. Author Krista Walsh has done a great job. The structure of the book especially is interesting, with each character narrating their own backstory. The author gives them unique voices and they become very three dimensional. Go grab this book right away and enjoy! I grew up in the south suburbs of Chicago where the houses are so close that you can reach out and touch both of them at once. Those suburbs are an eclectic mixing pot of cultures, religions, and poverty levels. I think such variety gave me a strong understanding conflict and identity at a very young age. I have one brother of my own blood, and a bevy of other siblings from remarriages and such. I have a wife and two daughters, and we now live in a more rural area, a state away, where I no longer have to make uncomfortable eye-contact with the neighbor if I look through my window towards their house. The biggest thing about me is that I love stories. Stories in every entertainment medium possible. If the story is good then I will watch/read/listen/or play it. I am an avid RPG gamer of both the pencil and paper variety, as well as console and PC. Lately, as the years have progressed, I find myself just listening to audio-books when I drive, I couldn’t even begin to tell you some of the current music anymore. I also love to do work on Photoshop, and design my own games and promotional art. 2) Tell us about your books. My current published work is all in the realm of traditional fantasy. The kind with elves, gnomes, dragons, and magic in a wondrous and mystical land far removed from our own. I sort of use those standard tropes as ‘comfort food’ for readers, something that is familiar. Then I turn it all upside down as I delve deeper into my world using my own races, cultures, and religions. I also like to rearrange a lot of those tropes that you may be comfortable with. For example, I have Dark Elves, yes, but their culture is nothing like what the standard tropes have dictated. A fan once told me, bless her heart, that my world is joyously unpredictable. You see, the world of Kuldarr is a progressive one. Within that world I have a novella line; Stormwind, Dark Consort, and Pononga. 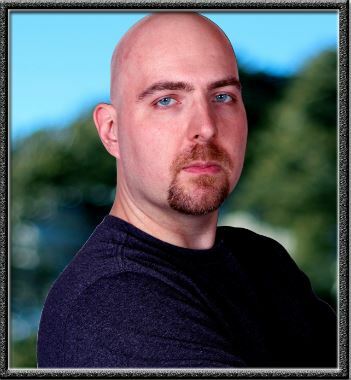 The novellas follows the path of a vagabond swordsman (Stormwind) who just can’t seem to stay out of trouble. It begins with him in a monastery trying to find out where he fits in this world. While there the village that the monastery protects is attacked. While he is attempting to defend the village, the son of someone important to him is kidnapped and he has to go on an adventure to save him. It is a more lighthearted read full of humor, action, love, and hope with a few twists and turns. It’s a tale of identity, and geared for a younger adult audience who also question their place in the world. The novel line, starting with Pariah, is much darker. It follows a young boy (Ashyn Rune) who suffers tragedy at an early age. He becomes hunted by ruthless killers, and his only hope for salvation lies with one of the most feared and despised creatures in all of Kuldarr. This tale is dark, and violent. Kirkus Review said it is ‘a dense and violent series opener, seeded with events of grand consequence’, and I have to say that it is quite fitting. Finally, this year I released a collection of short stories called Exactors: Tales from the Citadel, along with author J.P. Strohm. Again it takes place in Kuldarr, and tells the tales of a group of mercenaries that work for the most powerful religious organization in the world. These Exactors perform the jobs that others cannot, or will not do. They are a lot of fun, and with the help of J.P. Strohm, they really helped to flush out the dynamics of my world nicely. I like to explain my books as sort of like the MCU (Marvel Cinematic Universe), the story arcs are different, but there are threads in the books, even Easter eggs, that connect one with the other. They all share the same nations, history, world events and catastrophes, but the reader does not have to read Pariah to understand and enjoy any of my novellas, or vice versa. 3) Your book covers are real eye catchers. Who designs them? Thank you! I wish you could tell you that I did all the work, and that I am an outstanding artist, but it’s simply not true. A lot of people contributed to help make those covers what they are. First and foremost the talent lies in the photographers with their keen eyes, fierce attention to detail, and amazing use of lighting. Both Jason Bigart and Roy Ferrer do amazing work. Next are the models. They are all fantastic people, and great to work with, they have helped give real life to some of my characters. Ashley Erickson (no relation) of Hardshellart, has handled the concept design of some of my more unconventional races. Hope Norton did the original artwork for Pariah. After all of that, I plug them into Photoshop and attempt to recreate a scene from the books. Adobe Photoshop and InDesign really are amazingly flexible programs and are capable of some truly excellent stuff if you have the patience to learn through trial and error. That may sound like alot of work, and it would be easier to just hire an artist to create a cover, while I stick to writing. The truth is, I enjoy watching it all come to life. It helps make the world real to me, and everyone involved loves it. I think that helps. Because each one of them wants to deliver something special. I learned right away the importance of a catchy cover, my original Stormwind cover was lackluster, and it didn’t draw people in. It was a brutal lesson. Without a cover that stands out, and a solid blurb, your book is likely to be passed up even if your story inside is amazing. People may say ‘don’t judge a book by its cover’, but in the end they always do. 4) How do you handle the editing and stuff? The immensely talented Kathleen LaSelle is responsible for all the editing of my currently published work. She has over twenty years of editing experience and I was extremely lucky to have her services for my first few pieces. Exactors: Tales from the Citadel was her last job, and she has since retired. 5) What about world building? I have been designing the world of Kuldarr since 2005 even though I didn’t get published until 2015. I have developed well over five thousand years of history, along with nations, wars, political groups, secret societies, religions, etc. I wish I could say I have a definitive strategy in place, but really new ideas come along all the time. I just make sure that if changes are made, for the better or worse, it doesn’t violate the canon I already have in place with my history and current novels. I think my world building will always be an ongoing endeavor. I wish I had better organization because my world is spread out in numerous notebooks, hotel note pads, word documents, and on and on. 6) You joined the air force at nineteen, if I am not mistaken? Has that part of your life been an influence in your writing? Yes, absolutely. I have now been a member for the US Air Force for nineteen years, both active duty and as a reservist. It has influenced everything I do, consciously and subconsciously. You see, you can ask any service member, there is something different about people when you serve, when you are at war. The men and women next to you, they are not black, or white, yellow, or green. You don’t separate them, and identify them as Islamic or Christian, or Buddhist, or Atheist. They are your brothers and sisters pure and simple. They are the person that you count on to bring you home at the end of the day, and they count on you to do the same for them. It is an exceptionally rare camaraderie that I have truly not encountered at any other career I have ever had. As such, I have tried to convey such connections with my own characters, especially in the face of adversity. Another great thing thanks to the Air Force, is that I am well traveled. I have had the immense luxury of interacting, and learning from many other cultures and societies, which has truly broadened my understanding of the world around me. That is the beautiful positives that I attempt to emulate in my writing. Camaraderie and rich cultures. On the other end of the spectrum is war. War is ugly. The best laid plans often fall apart after the first thirty seconds of battle. Fear is thick and rampant. Everyone has it, even the toughest soldiers. Incursions are often brutal, swift, and immensely violent. I do my best to convey that ugliness as well. 7) How many words do you write a day? I read an article once, I think it was in Writer’s Digest, that a professional author should target 3000 words a day. So when I write, that’s my target. Honestly though, it’s extremely hit or miss, but it’s always my target. I treat writing like weight lifting. If I want to get in better writing shape, it has to get done. So even when I’m not feeling it, I still do it. I still write something. Writer’s block? I pound through it, inch by bloody inch. It may not be the best material, but that’s why there’s a drafting process after all. At the same token I don’t want to over strain or injure my writing muscles, so like a weight-lifter, I take off days to let those muscles heal. Now I know what you’re thinking. For a fantasy writer there’s not much fantasy in there. Truth is, I’ve always loved Science Fiction and thrillers over dragons and magic. I just seem drawn to writing Fantasy is all. 9) So what’s coming next from you? 2017 is going to be a full year for me, as well as for the readers I hope. I have the conclusion to the Blood Wizard Chronicles novella story arc, which will bring a close to the main character Stormwind’s narrative. I will also be releasing the sequel to Pariah. I have a handful of short stories that will crop up in a few anthologies, such as Missing Pieces, which is spearheaded by the talented C.E. Rocco. Finally, if everything goes well I might even have something completely new out, we’ll see! 10)Anything you would like to add? I want to thank A.J. Chaudhury for taking the time and energy to reach out to me for an interview, it is always flattering to be recognized for your work. I also want to thank all of the fans; past, present, and future. Thank you for taking a chance with my stories. For those of you that have come back for more, thank you for continuing to give this author the opportunity to entertain you. It means the world to me. 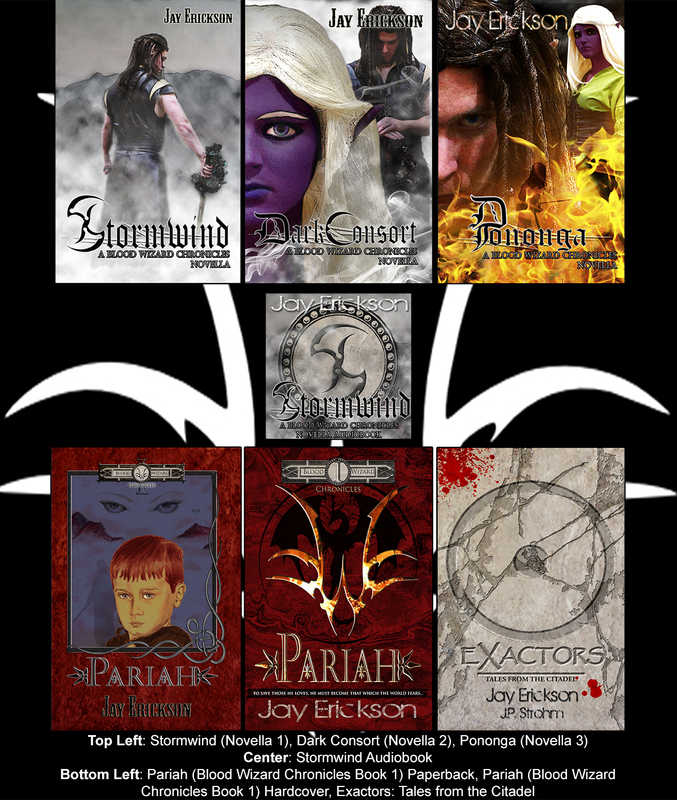 Pariah is the first novel in a four part series: The Blood Wizard Chronicles. This first book chronicles the story of a young boy named Ashyn Rune. He is special. Not chosen one, going to fulfill some ancient prophecy and save the known universe special, but different. At six years of age, he is fully literate and he can speak a multitude of languages. By eight, he knows advanced mathematics and can even predict weather movements. Yet there is more to him as well. Something he doesn’t really understand himself, for Ashyn can manipulate fire. His family loves him unconditionally, and he loves them with a passion. The rest of the village though is terrified of him. He is too strange. A freak of nature. A demon-spawn. A pariah. Then in the span of a single catastrophic day, he engulfs a rich man’s son in flames, and a terrible tragedy befalls his village of Bremingham. For the first time ever, Ashyn finds himself very alone. It doesn’t last . . . Between being hunted by Wild Elves, stalked by Dragons, lost in a magical forest maze, and enslaved by an Enclave claiming or-phans from war, Ashyn learns that there is more to him than just manipulating fire and being clever. Eventually he is discovered, and taken in by a man named Xexial Bontain. Xexial can see Ashyn’s particular gifts, and like the boy, this man too is an outcast. Xexial however chose his fate. For Xexial Bontain became that which the world around him fears, a wielder of a magic so perverse, so foul, that it taints the very land around it in its wake. A master of Destruction. A Wizard. The world hates and fears Wizards and should Ashyn follow this path, he too would be hated and feared. Yet is that so terrible a fate for a child who has been a pariah his entire life? As the years pass, Ashyn grows in power but also loneliness, until one day someone from his past is unveiled. Now the boy turned man is forced to make a desperate choice. Stay with Xexial and become a full-fledged wizard, finally learning to harness the power he requires to get vengeance for all that he has lost? Or, break his vow, and abandon everything he has gained to try and save the one he loves, knowing the result will once again be exile? Yet this time, he won’t just be hunted by the Wild Elves, but his own kind as well. Including the very the man who has become like a father to him . . .